Nippon Telegraph and Telephone Corporation (NTT) has successfully demonstrated 100 Gbps wireless transmission using Orbital Angular Momentum (OAM) multiplexing. This is the first time OAM multiplexing has been used for wirelessly transmitting such a high data rate. 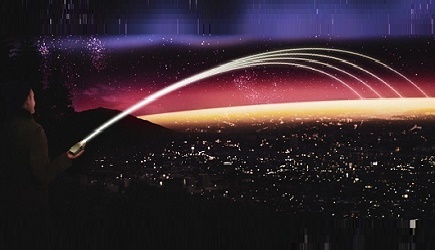 The eventual aim of this project is to achieve terabit-class wireless transmission to support the demand for wireless communications in the 2030s. It was shown in a laboratory environment that dramatic leaps in transmission capacity could be achieved by an NTT-devised system that mounts data signals on electromagnetic waves generated by this new principle of OAM multiplexing in combination with widely used Multiple-Input Multiple-Output (MIMO) technology. Orbital Angular Momentum (OAM) is a property of electromagnetic waves expressing phase rotation on the vertical plane in the propagation direction. The number of phase rotations is called an OAM mode. Given an electromagnetic wave having this OAM property, the trace of the same phase takes on a helical shape in the direction of propagation. An electromagnetic wave having this property cannot be received without a receiver having the same number of phase rotations at the time of transmission (that is, as in the relationship between a bolt and a nut, a wave cannot pass through without matching helical structures between the wave and receiver). For this reason, if multiple electromagnetic waves having different OAM modes are superposed, they can eventually be separated without mutual interference as long as a receiver is prepared that can receive beams with the same phase rotations corresponding to each OAM mode. Technology for transmitting multiple data signals using this feature is called OAM multiplexing transmission technology. 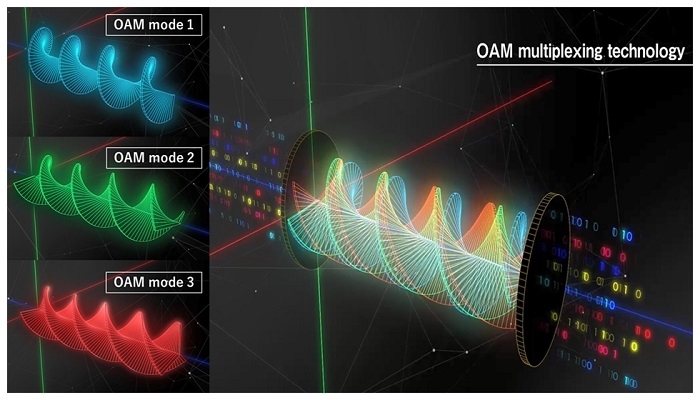 NTT has devised OAM-MIMO multiplexing transmission technology that combines OAM multiplexing transmission with widely used Multiple-Input Multiple-Output (MIMO) technology. This ingenious combination of MIMO technology enables the simultaneous processing of multiple sets of OAM multiplexing transmission while maintaining the OAM property that different OAM modes do not interfere with each other, which holds the possibility of multiplexed transmission that far exceeds the capacity of existing systems. NTT conducted transmission experiments at a distance of 10 meters in the laboratory using the devised system operating in the 28 GHz frequency band. Eleven data signals each at a bit rate of 7.2 to 10.8 Gbps were simultaneously generated and carried by multiple OAM-multiplexed electromagnetic waves, thereby achieving large-capacity wireless transmission at a world-first total bit rate of 100 Gbps. The results of this experiment revealed the possibility of applying this principle to large-capacity wireless transmission at a level about 100 times that of LTE and Wi-Fi and about 5 times that of 5G scheduled for launch. They are expected to contribute to the development of innovative wireless communications technologies for next generation of 5G systems such as connected cars, virtual-reality/augmented-reality (VR/AR), high-definition video transmission, and remote medicine. NTT is to present these results at Wireless Technology Park 2018 (WTP2018) to be held on May 23-25 and at the 2018 IEEE 87th Vehicular Technology Conference: VTC2018-Spring, an international conference sponsored by the Institute of Electrical and Electronics Engineers (IEEE) to be held on June 3-6. For details, click here.